Abstract: A female specimen of Aiolopus thalassinus was accidentally found in the central part of the Žďárské vrchy PLA (Bohemian-Moravian Highlands, Czech Republic) at an altitude of 815 m a.s.l. Due to high altitude, the general character of the habitat and the distance from the closest known localities, the finding is considered to be a very unusual record of the migrating individual. Abstrakt: V práci je popsán ojedinělý náhodný nález samice saranče slaništní (Aiolopus thalassinus) v centrální části CHKO Žďárské vrchy (Českomoravská vrchovina, kat. Fryšava, 6362) v nadmořské výšce 815 m. Vzhledemm k vysoké nadmořské výšce, charakteru biotopu a zejména značné vzdálenosti od nejbližších známých lokalit je nález považován za velmi neobvyklý zálet migrujícího jedince. Fig. 1. A female of Aiolopus thalassinus from Žďárské vrchy PLA (photo by P. Mückstein). Obr. 1. Samice saranče slaništní (Aiolopus thalassinus) nalezená v CHKO Žďárské vrchy (foto P. Mückstein). Aiolopus thalassinus (Fabricius, 1781) is a large (female body length 20–30 mm) grasshopper (Caelifera: Acrididae) widely distributed in Palaearctic, Afrotropical, Oriental and Australian regions, with a nominotypical ssp. A. thalassinus thalassinus (Fabricius, 1781) occurring in the Czech Republic. All published findings of A. thalassinus from the Czech Republic are very scarce, with their occurrence documented mostly on a wet meadows and salt marches in southern Moravian territory (Kočárek et al. 2005, Holuša et al. 2013). In the red list of threatened invertebrate species of the Czech Republic (Holuša et Kočárek 2005), A. thalassinus is mentioned as a critically endangered species. In both neighbouring countries with the southern Moravian territory (Austria and Slovakia), the species is more widespread but it seems only locally distributed. In Austria, the main distribution centre is the Neusiedler See (lake) region, and approximately 70 % of all records come from the area of Lower Austria and Burgenland, where the species occupied areas up to 300 m a.s.l. (Zuna-Kratky et al. 2009). Especially on the eastern bank of the lake and the neighbouring Seewinkel area, a large populations are possible to be found extensively. Thus the species is only considered as endangered in eastern Austria (Karner-Ranner 2009). In Slovakia, it inhabits extensively managed meadows, saltmarshes and pastures especially in the south of the country and its occurrence is considered to be rare. Several scarce findings from the mountain areas of Slovakia are also known (Orthoptera.sk 2015). Material: 1 adult female observed on Cirsium palustre on the forest road margin in spruce monoculture; at the crossroads “U boudy” near Křivý javor hill (824 m a.s.l. ), Fryšava pod Žákovou horou (land register), Žďár nad Sázavou district, Moravia, Czech Republic, 29.vii.2015, 815 m a.s.l., map grid No. : 6362, GPS: 49°38’37.9”N, 16°0’52.1”E, P. Mückstein observ. and photogr., R. Vlk det. There is no historical data about the occurrence of A. thalassinus in the territory of Žďárské vrchy PLA and it was not recorded during the intensive faunistic research of Orthopteran insects carried out there in the period of 2001–2003 (Holuša et Holuša 2005). Migrating individuals used to be found occasionally in the southern Moravia region (Chládek 1995, Holuša 1996) or to a moderate extent northwards (Holuša 2003). Currently, only one certain reproducing population near Sedlec is known in the Czech Republic (Slanisko u Nesytu National Nature Reserve) (Holuša et al. 2013, Kočárek et al. 2013). Due to high altitude over 800 m a.s.l. of the finding and general character of the habitat the record of one female A. thalassinus is considered to be of a migrating individual without any probability of continuous occurrence at the locality. The finding confirms an ability of this species to travel over a very long distance either from the closest known Czech locality (108,5 km in this case) or even from Austrian localities inside the continuous area of distribution, both under suitable climatic conditions. The first possibility seems to be more likely, but there is a possibility of discovering a still unknown locality situated closer to the current finding, too. Chládek F. (1995): Ensifera and Caelifera. Pp. 121–128. – In: Rozkošný R. et Vaňhara J. [eds]: Terrestrial Invertebrates of the Pálava Biosphere Reserve of UNESCO I. Folia Fac. Sci. Nat. Univ. Masarykianae Brunensis, Biologia, 92. Holuša J. et Kočárek P. (2005): Orthoptera (rovnokřídlí), pp. 133–134. – In: Farkač J., Král D. et Škorpík M. [eds. ]: Červený seznam ohrožených druhů ČR. Bezobratlí. AOPK ČR, Praha, 760 pp. Holuša J., Kočárek P., Vlk R. et Marhoul P. (2013): Annotated checklist of the grasshoppers and crickets (Orthoptera) of the Czech Republic. – Zootaxa, 3616: 437–460. Karner-Ranner E. (2009): Grüne Strandschrecke (Ailopus thalassinus). – In: Zuna-Kratky T., Karner-Ranner E., Lederer E., Braun B., Berg H.-M., Denner M., Bieringer G., Ranner A. et Zechner L. [eds. ]: Verbreitungsatlas der Heuschrecken und Fangschrecken Ostösterreichs. – Verlag Naturhistorisches Museum Wien, 204–205. 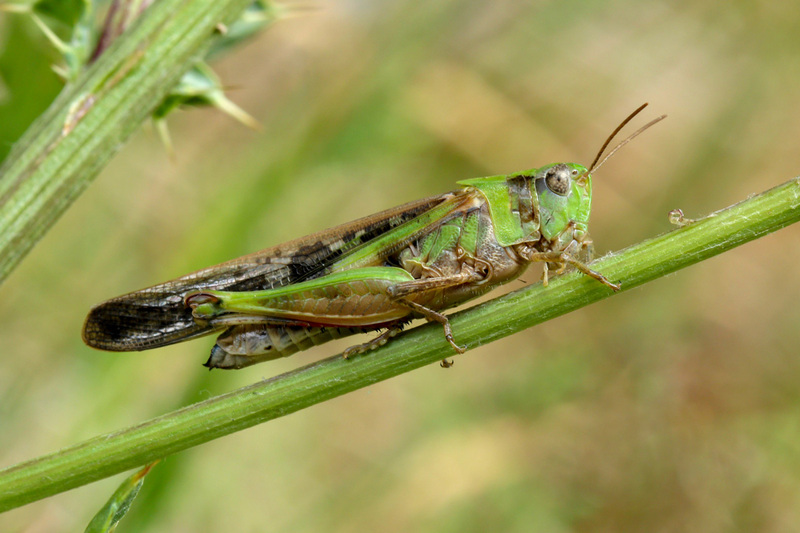 Kočárek P., Holuša J., Vlk, R. et Marhoul P. (2013): Rovnokřídlí (Insecta: Orthoptera) České republiky. – Academia, Praha, 288 pp. Zuna-Kratky T., Karner-Ranner E., Lederer E., Braun B., Berg H.-M., Denner M., Bieringer G., Ranner A. et Zechner L. [eds.] (2009): Verbreitungsatlas der Heuschrecken und Fangschrecken Ostösterreichs. – Verlag Naturhistorisches Museum Wien, 303 pp.